This image depicts one of the double pavilions at Greenwich Hospital on the banks of the Thames. 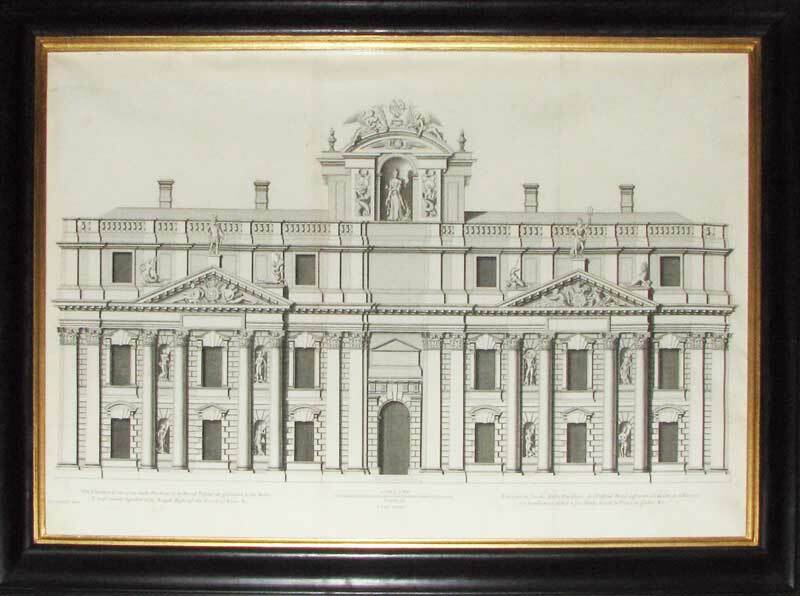 The famous C18th architectural work 'Vitruvius Britannicus' was a large collection of plates, mostly of English country houses, begun by Colen Campbell to celebrate the English Baroque of Vanbrugh, Hawksmoor and Archer, and, more significantly, to promote the Palladian revival and his own designs. Most of the plates were engraved by Hulsbergh after Campbell, Inigo Jones et al. Published in London in 1715, 1717 and 1725, the famous houses and buildings include Castle Howard, Whitehall and Blenheim, but there are also plans for houses, which never left the drawing board. Further series were issued by John Woolfe and James Gandon in 1767 and 1771.